AMERIGEL advanced line of Skin & Wound Care products help to restore your skin back to health with the latest in skin care solutions. See why AmeriGel products are not only recommended by leading physicians, but have consistently earned the #1 topical ranking by physicians in multiple categories. See why leading physicians and health care providers across the country are switching to AMERIGEL Advanced Skin & Wound Care products. 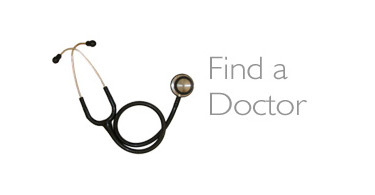 Locate a Doctor Near you! Get professional advice! 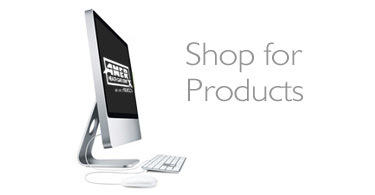 Let us help you find a physician who is familiar and experienced with AMERIGEL products. According to the 2014 National Diabetes Facts Sheet, Diabetes currently affects 29.1 million children and adults in the United States. In 2012, 1.7 million new cases of diabetes were diagnosed in people aged 20 years or older. About 60-70% of people with diabetes have mild to severe forms of nervous system damage including impaired sensation or pain in the feet or hands that can lead to amputations. Statistics show more than 60% of non-traumatic lower-limb amputations performed in the United States were related to diabetes. 1) Inspect your feet daily. 2) If you detect any break in the skin, contact your doctor immediately to schedule an appointment. 3) Cleanse your wound with AMERIGEL Wound Wash. Apply AMERIGEL Hydrogel Wound Dressing directly to the wound. Cover the wound with a sterile gauze pad or band aid. 4) Follow-up with your doctor. 2) Wash and dry your feet thoroughly, especially between the toes. 3) Apply AMERIGEL Care Lotion to your feet daily to hydrate your skin. 4) Keep your toenails trimmed short and straight across. 5) Wear comfortable shoes and clean socks that properly fit your feet. 6) Avoid wearing the same shoes two days in a row. See your podiatrist for an annual foot check-up and any severe or persistent problems. Rated #1 Topical Wound/Ulcer treatment by Podiatric Physicians. Provides a moist wound environment to promote natural wound healing for cuts, scrapes, wounds and ulcers. Antibiotic Free- Safe for patients with known allergies to common topical triple antibiotics. The advanced line of AMERIGEL Skin and Wound Care Products was developed by Amerx Health Care Corporation to treat a variety of skin conditions. 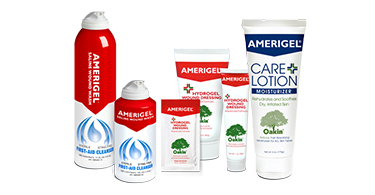 AMERIGEL products help to promote the natural healing of wounds, ulcers, burns and cuts; moisturize skin to prevent breakdown associated with diabetic dry skin; and protect and relieve dry chafed or irritated skin. We invite you to learn more about which AMERIGEL product(s) can help resolve your skin condition.